In the year 1017 A.D., Ramanuja was born in the village of Perumbudur, about twenty-five miles west of Madras. His father was Kesava Somayaji and his mother was Kantimathi, a very pious and virtuous lady. Ramanuja’s Tamil name was Ilaya Perumal. Quite early in life, Ramanuja lost his father. Then he came to Kancheepuram to prosecute his study of the Vedas under one Yadavaprakasha, a teacher of Advaita philosophy. Ramanuja was a very brilliant student. Yadavaprakasha’s interpretations of Vedic texts were not quite up to his satisfaction. Ramanuja pointed out many mistakes in the exposition of his master. Sometimes he gave his own interpretations which were much liked by all the co-students. This made Yadavaprakasha very jealous of Ramanuja. Yadavaprakasha made a plan to take away the life of Ramanuja. He arranged for Ramanuja and his cousin Govinda Bhatta–a fellow student–a pilgrimage to Varanasi. Govinda Bhatta, being a favourite student of Yadavaprakasha, came to know of the latter’s plan while they were travelling. He at once apprised Ramanuja of the danger and helped him to escape. By the grace of God, Ramanuja escaped with the help of a hunter and his wife whom he accidentally met on the way. About the end of the tenth century, the Visishtadvaita system of philosophy was well established in Southern India and the followers of this creed were in charge of important Vaishnavite temples at Kancheepuram, Srirangam, Tirupathi and other important places. The head of the important Vaishnavite institution was Yamunacharya, a great sage and profound scholar; and he was also the head of the Mutt at Srirangam. One of his disciples, by name Kanchipurna, was serving in the temple at Kancheepuram. Although a Sudra, Kanchipurna was so very pious and good that the people of the place had great respect and reverence for him. At present, there is a temple at Kancheepuram where Kanchipurna’s image has been installed and where he is worshipped as a saint. Young Ramanuja came under Kanchipurna’s influence and had such reverence for him that he invited him to dinner in his house. Ramanuja’s intention was to attend on Kanchipurna and personally serve him at dinner and himself take meals afterwards. Unfortunately, Kanchipurna came to dinner when Ramanuja was not at home, and took his meals being served by Ramanuja’s wife. When Ramanuja returned home, he found the house washed and his wife bathing for having served meals to a Sudra. This irritated Ramanuja very much and turned him against his wife who was an orthodox lady of a different social ideal. After a few incidents of this nature, Ramanuja abandoned the life of a householder and became a Sannyasin. After the death of Yamuna, his disciples at Srirangam and other places wanted Ramanuja to take Yamuna’s place as the head of the Mutt at Srirangam. This was also the expressed wish of Yamuna. Accordingly, Ramanuja took his place and was duly installed with all the attendant ceremonies and celebrations as the head of the Visishtadvaita Mutt at Srirangam. Ramanuja then proceeded to Thirukottiyur to take initiation from Nambi for Japa of the sacred Mantra of eight letters Om Namo Narayanaya. Somehow, Nambi was not willing to initiate Ramanuja easily. He made Ramanuja travel all the way from Srirangam to Madurai nearly eighteen times before he made up his mind to initiate him, and that too, only after exacting solemn promises of secrecy. Then Nambi duly initiated Ramanuja and said: “Ramanuja! Keep this Mantra a secret. This Mantra is a powerful one. Those who repeat this Mantra will attain salvation. Give it only to a worthy disciple previously tried”. But Ramanuja had a very large heart. He was extremely compassionate and his love for humanity was unbounded. He wanted that every man should enjoy the eternal bliss of Lord Narayana. He realised that the Mantra was very powerful. He immediately called all people, irrespective of caste and creed, to assemble before the temple. He stood on top of the tower above the front gate of the temple, and shouted out the sacred Mantra to all of them at the top of his voice. Nambi, his Guru, came to know of this. He became furious. Ramanuja said: “O my beloved Guru! Please prescribe a suitable punishment for my wrong action”. Ramanuja said: “I will gladly suffer the tortures of hell myself if millions of people could get salvation by hearing the Mantra through me”. Nambi was very much pleased with Ramanuja and found out that he had a very large heart full of compassion. He embraced Ramanuja and blessed him. Having thus equipped himself with the necessary qualifications, Ramanuja succeeded Yamuna. By this time, Ramanuja’s fame had spread far and wide. He became a good controversialist. Then he wrote his commentary on the Brahma Sutras known as the Sri Bhashya. The Visishtadvaita system is an ancient one. It was expounded by Bodhayana in his Vritti, written about 400 B.C. It is the same as that expounded by Ramanuja; and Ramanuja followed Bodhayana in his interpretations of the Brahma Sutras. 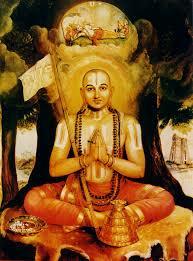 Ramanuja’s sect of Vaishnavas is called by the name Sri Sampradaya. Ramanuja wrote also three other books–Vedanta Sara (essence of Vedanta), Vedanta Sangraha (a resume of Vedanta) and Vedanta Deepa (the light of Vedanta). The two unfortunate people started for Srirangam–their native place. Mahapurna was a very old man, and unable to bear the pain, died on the way. Kuresa alone returned to Srirangam. The king of the place was Bhatti Deva of the Hoysala dynasty. The Raja’s daughter was possessed of some devil and nobody was able to cure her. Ramanuja succeeded in exorcizing the devil and the princess was restored to her former health. The king was very much pleased with Ramanuja and readily became his disciple and he was converted by Ramanuja into a Vaishnavite. Thereafter Ramanuja firmly established himself in the Mysore king’s dominions, constructed a temple at Melkote, and created a strong Vaishnavite community there. The Pariahs or depressed classes (now called Harijans) of the place were of great service to Ramanuja; and Ramanuja gave them the right of entry inside the temple which he constructed at Melkote–on some fixed days and with some limited privileges–which they enjoy to this day. Ramanuja constructed a few more Vishnu temples in and about Mysore, set up a strong Vaishnavite community and put them in charge of his disciples to continue his work and spread the Visishtadvaita philosophy and Vishnu worship throughout the king’s dominions. Thus he continued his labours here for nearly twenty years and his followers numbered several thousands. Ramanuja was the exponent of the Visishtadvaita philosophy or qualified non-dualism. Ramanuja’s Brahman is Sa-visesha Brahman, i.e., Brahman with attributes. According to Ramanuja’s teachings, Lord Narayana or Bhagavan is the Supreme Being; the individual soul is Chit; matter is Achit. Ramanuja regards the attributes as real and permanent, but subject to the control of Brahman. The attributes are called Prakaras or modes. Lord Narayana is the Ruler and Lord of the universe. The Jiva is His servant and worshipper. The Jiva should completely surrender himself to the Lord. The oneness of God is quite consistent with the existence of attributes, as the attributes or Shaktis depend upon God for their existence. This entry was posted in Biosketch, Hindu Dharma and tagged Ramanujacharya, Srirangam, Visistadvaita on March 23, 2017 by arisebharat.